Buying the best speargun the first time is essential! if you are an experienced spearfisher or a beginner. The speargun is an extension of your arm, and when you know your speargun and trust it, it gives you great security and joy. Therefore, it’s important that you choose the right speargun! A word of caution: The speargun is a potentially dangerous fishing gear, and it’s important that you use caution when operating it. 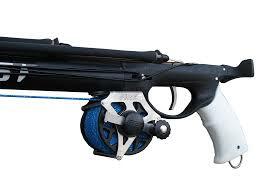 What best spearfishing gun to buy? When choosing your speargun, there are a number of choices to make, as the speargun is one of the most important tools you have as a spearfisher. What are the size of the fish you want to catch? What is the underwater visibility where you are going to hunt? 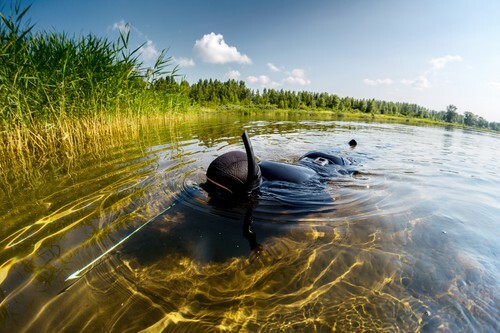 Are you going to hunt in open water or on wrecks or in caves? Open muzzle or closed muzzle? Should I use a line reel on my speargun? When referring to the length of the speargun below, I am referring to the barrel of the speargun (where the elastic band is attached). E.g., for a 90 cm (35 inch) speargun, the spear will be around 130 cm (51 inch). What are the sizes of the fish you want to catch? 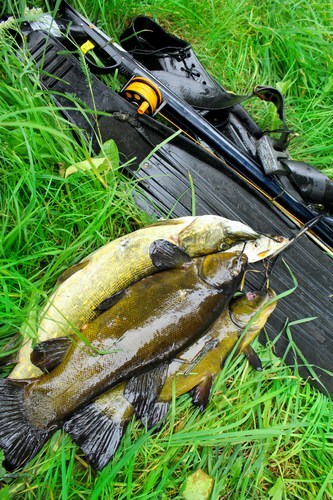 The size of the fish that you want to catch influences the size of the speargun you should buy. If you are going to hunt fish around 10 kgs (22 lb), like a sea trout for example, this may justify a large speargun with a reel. 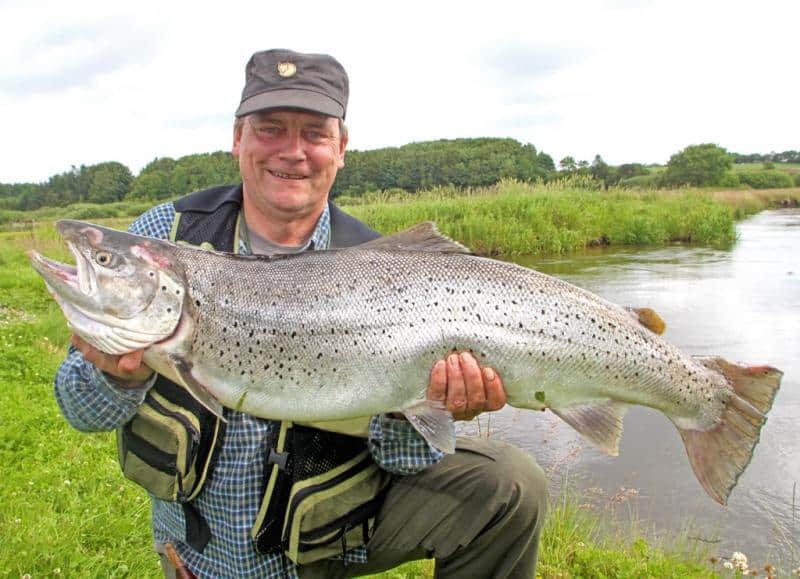 See picture below showing a sea trout of 10 kg (22 lb) – it’s a big fish :). For fish in the 10 kg (22 lb) range, a speargun of 110-130 cm (43-51 inch) will be appropriate. However, you won’t come across fish of this size every day as spearfisher. Rob Allan of 120 cm (47 inch) is an example of a speargun you can use when you are looking for a gun with some power that can withstand greater loads. 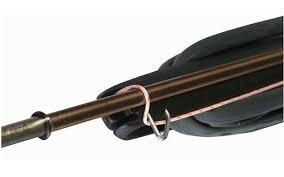 With this type of speargun you will be able to catch fish at +20 kg (44 lb). Smaller fish require smaller spearguns. These guns have the advantage that it is easier to maneuver in the water. A speargun of 75 cm-100 cm (29-39 inch) will usually be a reasonable size. This size speargun still has good power that provides adequate penetration, even of larger fish if they are within range. A barrel between 75 cm-100 cm (29-39 inch) provides a good penetration in the 2m-3.5m range, depending on the type of rubber band you use. This means that if you, for example, encounter a 10 kg (22 lb) sea trout or a 15 kg (33 lb) cod, you can still make a sure shot with a 75 cm-90 cm (29-35 inch) speargun. You just have to be close enough (about 1-1.5 m / 3-4 ft). Most fish are shot at this distance. 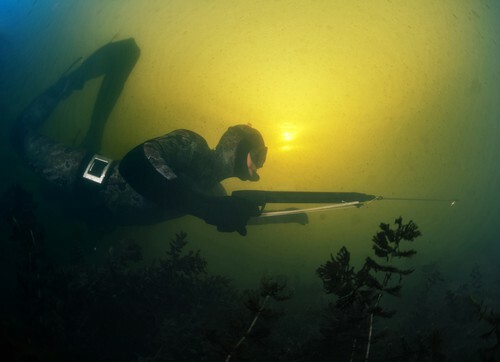 The visibility of the water influences how long of a range your speargun has to have. As a rule of thumb, the better the visibility, the longer the range your speargun should have. In case of poor visibility you can, with a speargun that has a 75 cm-100 cm (29-35 inch) barrel length, keep the arm back so the tip of the spear is right next to your face. This in turn means that with a 75 cm-90 cm (29-35 inch) spear, you can hunt successfully and efficiently in waters with a visibility of around 1-5 m (3- 4 ft). Underwater hunting in open waters or in caves and wrecks? As previously mentioned, a larger speargun isn’t as maneuverable as a smaller one. If you are hunting in open waters, the maneuverability is less important, as opposed to if you are hunting in caves or wrecks. I will recommend 100 cm (39 inch) in open waters with good visibility. If you are hunting in caves or wrecks, a 75 cm (29 inch) speargun will be appropriate. 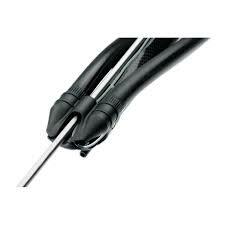 A 90 cm (35 inch) speargun is the all-round choice which normally covers many situations. If you need spearguns in different lengths, it is a good idea to choose the same speargun model, as it means that you don’t have to get used to a new way of aiming and loading when you switch between different lengths. Thus, you can transfer your skills and experience from one length to another. Hold on to what works! I can understand if you want to try a lot of different spearguns, but if you have found one that works well for you, then hold on to it. In the end, the speargun will become a natural extension of your arm and you will make one precision shot after another. 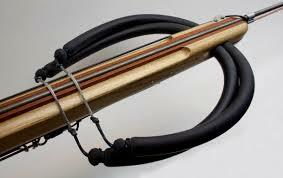 A band-powered speargun has a simpler mechanism and you are able to replace all parts yourself. If you end up choosing pneumatic, then don’t switch between the two types. The manner of which you aim and shoot is very different and if you frequently switch between the two different types of speargun, it will be difficult to get a stable precision. The advantages of a band-powered speargun are that the system is very simple and you can replace everything continuously. You can repair them easily and in an affordable manner. The system tolerates sand (everywhere) and you don’t need to worry about releasing the pressure from the air cylinder, if you have to travel and fly. A pneumatic speargun risks exploding if the pressure is not released before a flight. Band-powered spearguns are often cheaper than pneumatic spearguns! The advantages of pneumatic spearguns are that they can achieve more force than a band-powered speargun of the same length and they have less recoil. 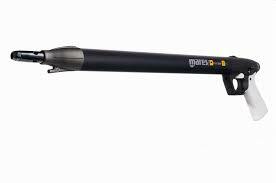 A pneumatic speargun has minimal recoil and you can make long shots with a certain degree of accuracy. The muzzle is the front of the speargun. On an open muzzle speargun, the spear is placed on top of the barrel and is held by the way you place the spear line (see picture below). A speargun with closed muzzle (see picture below) has a kind of spear holder at the end. The spear is pulled through this holder when you load the speargun. An open muzzle speargun is generally a hassle to load and it takes a longer time. On a night dive or under harsh conditions (waves, currents, wind) it can also be a little stressful with all the lines. The big advantage of an open muzzle is that you do not have the aforementioned spear holder (muzzle) placed in the field of vision where you have to aim. It is something you learn to compensate for, but it is without doubt easier to aim with an open muzzle. Another advantage of the open muzzle is that you can make use of a special types of spears (sharkfins spear and line / Dyneema wishbone) and wishbone. The wishbone is the device that connects the rubber bands and is attached to the spear. Open muzzle guns are gentler for fingers and hands compared to the corresponding for a closed muzzle. No matter what, ALWAYS remember gloves! For the abovementioned two reasons (aim and wishbone), quite a lot of experienced underwater hunters swear by an open muzzle. It is largely a matter of personal preference. To load a closed muzzle speargun is relatively fast once you have learned how to do it, but it can cause a beginner a lot of hassle and inconvenience. I recommend beginners go for a closed muzzle, but I can see the advantage of using an open muzzle. If you participate in competitions where time is a factor, closed muzzle will have an advantage. An alternative is the speargun ExiumG2, where you can choose whether you want an open or closed muzzle. This way you do not make a wrong purchase on that account. You can read a test of this speargun here. Generally it has really fine performance. A reel is only necessary if you are hunting for larger fish than, for example, 7 kg (15 lb). At depths greater than 10 m (32 ft). The advantage of a reel for your speargun is that you do not have to swim to the surface with your fish after you have shot it. 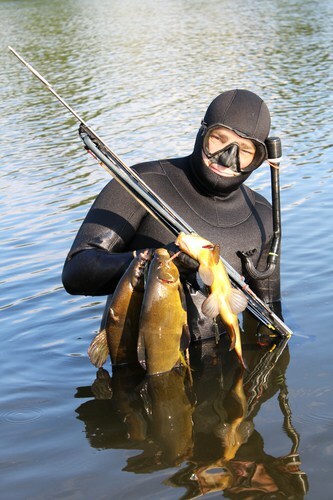 There are many good spearguns on the market and the price can vary a lot. The most expensive are pure handicrafts with carved handles, bronze molded bottom pieces, inlaid carbon fibre, etc. This will not be something you have need as a beginner, since it is not necessary in order to catch fish. An example of a speargun that is has been used by many spearfishers through the years is Omer Cayman. This speargun has been tested and is simple and effective to use. Safety is important when you are dealing with spearguns. This is a weapon. Never have a loaded speargun above the water. Never point it at others or yourself. Never rely on the security system – always rember to discharg the rubber bands. If you have to use both hands – Do not hold it between your legs when it’s armed (or with tense rubber band). Never leave a loaded speargun on the seafloor.